When it comes to weddings of 2018/2019, it’s all about making it your own. So not surprising then, this clever customisation is making its way through to the menu. Although it’s the sentiment of the day that wins out in the end, marking your commitment as a couple, fact is, how it all comes together is representative of the promise you are there to make. When it comes to making your matrimonial mark, menus and desserts play an important role in the overall vibe of the day and they’re getting more creative every year. Expect to see more DIY food bars at weddings of 2019, with an increasingly unique mix of foods. More couples are steering clear of the traditional three course meal and serving comfort foods such as pasta, pizza and burgers. Brunch-themed weddings are trending in a very big way. A less expensive option, they’re featuring everything from street style food caravans through to make your own meal stations and with that, we’re seeing a big uptake in dessert bars. 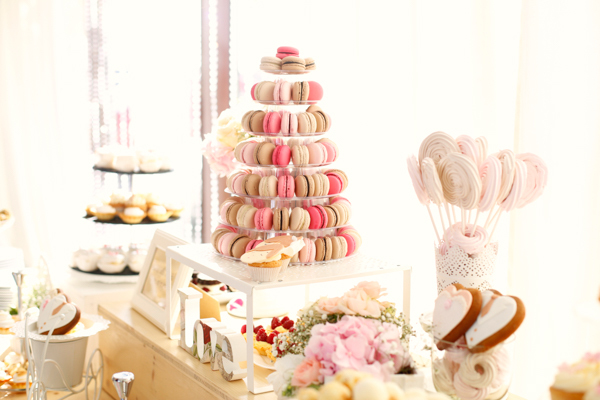 From rustic homemade tarts to elegant French macarons, delectable desserts not only satisfy the sweet tooth of the most hardened guest, but they add personality to a very personal day. Tie your sweet treat into your overall theme, make it something special that is specific to you as a couple, or perhaps create a coffee and tea bar. The world is your culinary oyster.